Give your home that extra spring in its step! The time has come to pack away the heaters, swop your electric blankets for picnic blankets and start soaking up the fresh air... but is your home ready? During the last few months you have probably avoided certain areas of your home and opted to huddle up in the warmer areas (like your cosy lounge), and neglected other areas (for example, your patio or garden) because you would much rather stay in and keep warm, but change has come! Spring is literally here and that means less huddling and more entertaining (outdoors if you’re lucky) – but these previously avoided areas now need to be readied up for spring fun! Springtime always inspires us to clean out clutter and make way for new, fresh life. Many of us have been working on getting our bodies ready to rock the summer - and now it’s time to do the same for our homes. Inspect-a-home: The first (and probably key) step to take would be to do a proper walkthrough and inspection of your home, both inside and outside. This will help you identify any structural and décor changes you may want to start planning and budgeting for – especially with the coming rains. Be sure to look out for paint cracks, dirty gutters, broken or cracked tiles on the roof etc. Open those windows and doors you fought to keep shut during the winter time – they need to work properly for spring time ventilation. When inspecting the inside of your home, remember to check on the air-conditioning system or the fans – you will be needing them to keep cool in the summer months! Make a list of all that you can identify and work through it from order of importance. Add colour to your garden: The garden will probably have taken a beating during the winter months and thus will need additional attention to get it to blossom (literally). 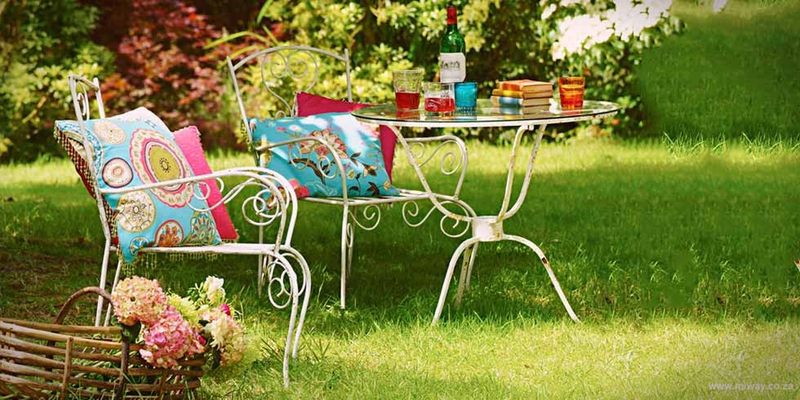 Creating a stunning garden doesn’t have to break your bank – you can definitely create a perfect garden on a budget. While you’re at it, remember to check the other things that make up the outdoors – such as your sprinklers or garden hoses, your walkways and areas surrounding your pool and plant beds. Complement your pool: Warmer weather means more time around the pool, so the last thing you want is to be finding yourself with a pond for a pool. Your pool has had enough time to hibernate, and it’s time for it to come to the party - and look the part! Make room for the fresh air: Growing up, we all had some sort of encounter with ‘Spring Cleaning’ and somehow knew that when September hits, it’s that time! 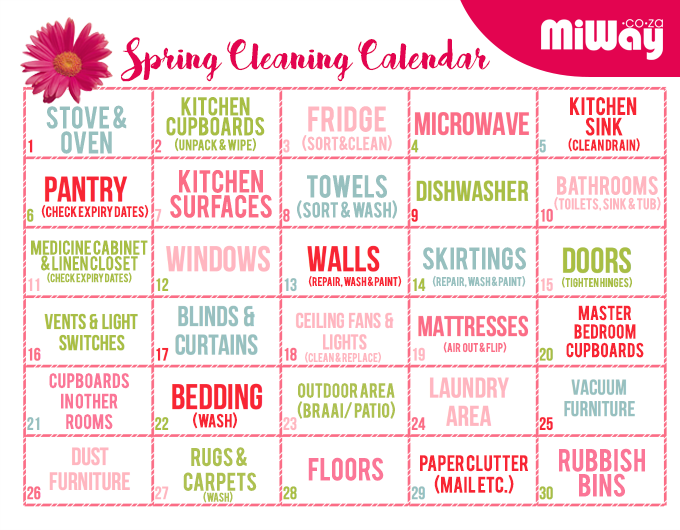 We’ve taken the liberty of helping you along your spring cleaning expedition by mapping out a calendar for you… nobody said it had to ALL be done in one day, right? Decluttering will help you make way for those new décor items you’ve been eyeing, and maybe add a little colour to brighten up the space.